By The Ohio Chemical Manufacturing Co. Dated 9-44. Size small. The mask looks very good and is lovely and flexible retaining excellent overall shape. The rubber is reasonably clean and appears to be free of cracking/crazing. The webbing harness and oxygen hose are very good bar light surface verdigris on metal parts. 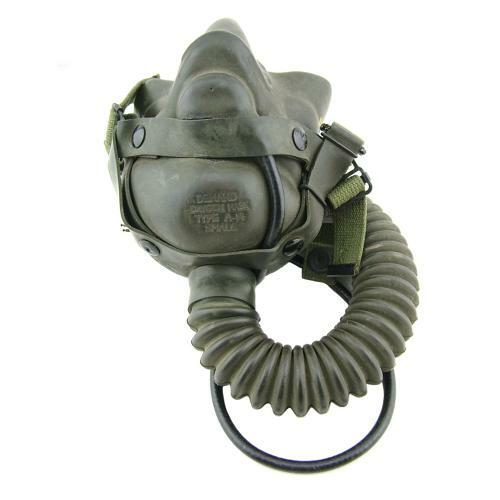 This mask has the rare 8th Air Force modification that involved adding rubber 'washers' over the oxygen inlet ports. Also fitted with an ANB-MC-1 microphone, loom and 2-pin PJ-292 plug. A great display piece. Stock code O23103.